Licensed To – Parlophone Records Ltd. Copyright (c) – Parlophone Records Ltd. Published By – RZO Music, Inc. Published By – RZO Music Ltd. Distributed worldwide in a limited edition of 15,000 copies. Released for Record Store Day 2015. North America – Tintoretto Music (BMI) administered by RZO Music Inc., Screen Gems-EMI Music, Inc. (BMI) o/b/o EMI Music Publishing Ltd., Chrysalis Songs (BMI). Rest of World - Tintoretto Music/RZO Music Ltd., EMI Music Publishing Ltd., Chrysalis Music Ltd.
Track A: Digital remaster ℗ 2014 The copyright in this sound recording is owned by Jones/Tintoretto Entertainment Co., LLC under exclusive license to Parlophone Records Ltd.
Track AA: Digital remaster ℗ 2015 The copyright in this sound recording is owned by Jones/Tintoretto Entertainment Co., LLC under exclusive license to Parlophone Records Ltd. Overall, this pressing isn't great, but it's not too bad either. Some minor surface noise and some stray pops in the quiet segments. Popping during the loud parts on side A, but not awful (bigger grooves, more space for dust to get in?). 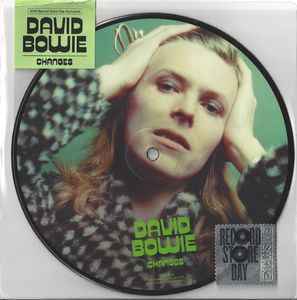 Picture discs are really more to be looked at, and not played, so this serves it's purpose. The package isn't great, it had some general guff on it in the store when I got it, and to open it, you need to slice the sticker on top, which will probably give collectors a migraine. Is this version of Eight Line Poem available anywhere else? I can't find any other releases that have this "GEM Promo Version"
Nevermind, it's on the Bombers promo. Can't wait for most of these to be sent to the "independent" shops like Amoeba, and leave the actual independent shops out in the dust. How can there be three already having that item if RSD is three weeks to go??? This is ridiculous..... for me RSD is every day! Already a copy for sale!? RSD is becoming a bigger and bigger joke every year. Just wait a year and you can get all this overpriced, repackaged crap for half the cost. Record Hype Day 2015.